Titan, Saturn's “Mystery Moon,” is also its largest moon and the second largest moon in the entire solar system. Similar in size to the four largest satellites of Jupiter, Titan is much bigger than the planets Pluto and Mercury. Dutch astronomer, Christiaan Huygens, discovered Titan in 1655, using a homemade telescope. The landing probe carried to Saturn by the Cassini spacecraft centuries later is named after Huygens. Some scientists believe that Titan could be one of the best hopes for finding life or signs that there once was life outside of Earth. The dense atmosphere on this moon could be similar to Earth’s in its early years. Actually, the atmosphere of Titan is very, very thick; it is more dense than that of Earth by 50 percent. Astronomers question how Titan is smaller than Earth is yet holds that much atmosphere. The first probe to visit Titan was the Voyager I in 1980. One surprise in the data it sent back was that Titan's atmosphere consists of a lot of nitrogen. Most scientists were expecting it to contain more ammonia, which is very common on moons and on outer planets. Scientists theorize that the nitrogen was trapped in its ice when Titan was first forming. Titan also contains many organic molecules; this is the substance on which life is based. Besides nitrogen, Titan has a trace of methane gas in its atmosphere. The methane in Titan can either be solid, liquid, or gas. 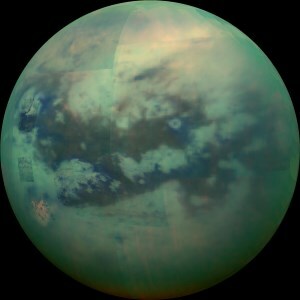 Interestingly, rain and snow made out of methane are able to fall on Titan. Even though it's cold here, the moon has rivers and seas of liquid methane and ethane. The surface of Titan is mostly obscured by its clouds. This means that there is little known about what lives under them. With the 1980 probe, scientists were able to take measurements on the moon’s density. These measurements indicated that Titan has a rocky core scientists estimate to be 2,100 miles in diameter, which could be covered with 530 miles of thick ice. The Cassini spacecraft, which arrived to the Saturn system in 2004, provided much more information that may-once explain in full-may reveal what really could be on the icy surface of Titan.